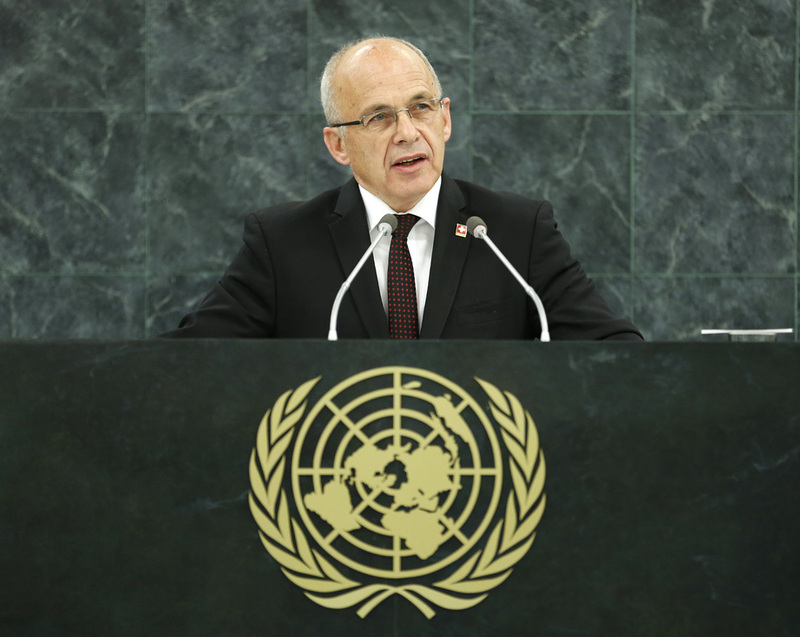 UELI MAURER, President of Switzerland, recalled the country’s long history as a neutral State with a humanitarian tradition, saying its foreign policy had been anchored in peaceful cooperation among States. Switzerland had been making its neutral soil available for peace talks and would continue to contribute to world peace. The protection of human rights was a key element of Swiss commitment, he said, expressing concern over widespread violence and human rights violations around the world. Violent conflicts in the Middle East, particularly in Syria, were causing inacceptable suffering for civil populations, he said, stressing that the serious and systematic violations of international humanitarian law and human rights must not be tolerated under any circumstances. He called on the Security Council to refer the situation in Syria to the International Criminal Court, describing the use of chemical weapons as a particularly despicable crime. Appealing to the Council’s permanent members to overcome their differences and find common ground for a political solution to the conflict, he emphasized that the international community must spare no effort to pave the way for another peace conference in Geneva. Citing several Articles of the United Nations Charter, he said they provided a promising foundation for peaceful cooperation among all peoples of the world. In international politics, however, “much is said of how things should be and too little is said about how things actually are.” Global problems needed global discussions and collective solutions, he said, adding that the United Nations should be the place where that would happen. In order to live up to that role, the Organization must be efficient, innovative and effective, he stressed. Expressing concern over the return of “power politics”, he observed that large States were once again choosing to exercise their power and strength, while smaller ones were accepted less and less as equal partners. Nations should be free to choose paths of their own design, he said, adding that his country believed in the peaceful diversity of sovereign States treating each other fairly and as partners. The way in which large nations had acted recently in dealings with small ones had “unnerved” Switzerland, he continued, pointing out that they often placed power above law. Reminding delegates that the principles of equal rights of peoples and the sovereignty of nations were born of lessons from history, he called on Member States to commit themselves to a peaceful world, in which peoples and nations would enjoy equal rights and share equal values.